You already know that sunscreen is a must in your skincare routine, and not just to prevent sunburn. Regular sunscreen use will help stave off premature aging, dark spots, uneven skin tone, and even skin cancer. You have more choices now than ever before, especially in the natural sunscreen realm. But all those choices can be incredibly overwhelming. We're breaking it all down for you here, to help you make the right sunscreen choice for you and your family. Why Choose a Natural Sunscreen? Reduced exposure to synthetic chemicals. Most people choose natural sunscreens because they're looking to reduce the amount of chemicals they're exposed to on a daily basis. Some people just don't trust chemical ingredients and don't want to put them on their skin. As of late, some of the ingredients found in chemical sunscreens have come under scrutiny. Oxybenzone has been shown to disrupt hormones, at least in lab rats. Other active ingredients in chemical sunscreens have been linked to possible hormone disruption and cancer. Again, these ingredients have not been proven unsafe. There's no conclusive evidence that any of the synthetic ingredients used in sunscreen cause harm—to humans at least. Reduction in negative impacts on the environment. There is evidence that chemical-based sunscreens are polluting the environment. Going to an exotic beach locale? Some require that you use natural-based sunscreens only, to avoid possible harm to fragile ecosystems. Synthetic sunscreen irritates your skin. If you've got particularly sensitive skin, eczema, psoriasis, or easy irritation from chemical sunscreens, then natural may be a great option for you. The active ingredients in natural sunscreens (more on what those are in a bit) are less likely to cause skin irritation than chemical sunscreen ingredients. So, people with ultra sensitive skin can get sun protection without irritating their skin. What Makes a Natural Sunscreen "Natural?" Simply, it's the active ingredients in the sunscreen that determine whether a sunscreen is natural or not. 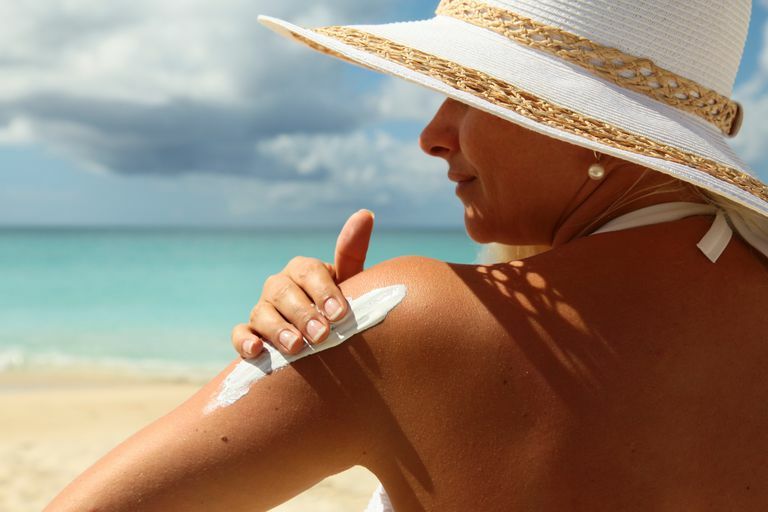 In the U.S., titanium dioxide and zinc oxide are the only natural sunscreen ingredients that are approved by the FDA. If these minerals make up the active ingredients in your sunscreen, it's "natural." If it contains synthetic active ingredients like oxybenzone, octinoxate, or avobenzone, it's not a natural sunscreen but rather a chemical sunscreen. But, don't let the term natural trick you into thinking you're getting a 100 percent natural product. You're (most likely) not. Remember, the "natural" in your natural sunscreen only refers to the active ingredients. The rest of the ingredients in natural sunscreen can be completely synthetic. The short answer: organic is a marketing term, at least where the beauty industry is concerned, and has nothing to do with the active ingredients in your sunscreen. For the longer answer, we have to take a look at where the beauty industry and the scientific community have split again. Scientifically, organic compounds contain carbon. Titanium dioxide and zinc oxide do not contain carbon—they are inorganic materials. Many of the synthetic ingredients in sunscreen do contain carbon, so they are technically Many of the synthetic ingredients in sunscreen do contain carbon, so they are technically organic. The FDA does not have very specific guidelines as to what constitutes an organic product. So, it seems counterintuitive, but natural sunscreen ingredients are technically "inorganic," and synthetic sunscreens can be labeled "organic." Know that the organic label on sunscreen usually means it has some type of botanical ingredients (green tea extract, for example) that was produced without pesticides. Organic does not necessarily mean your product is 100 percent natural, non-synthetic, or uses natural active ingredients. As we mentioned before, zinc oxide and titanium dioxide are the only ingredients approved by the FDA to give your sunscreen a natural SPF. Zinc oxide and titanium dioxide are minerals, naturally found in the earth. Once they get into your sunscreen, though, they have been processed and refined. You're probably familiar with these minerals. Parents, you'll be familiar with zinc oxide from other products: baby powder and creams. Diaper rash creams contain tons of zinc oxide; it's the ingredient that soothes and heals your baby's sore bottom. Titanium dioxide is widely used in the skin care industry too. It's used in mineral makeup and foundations, soaps, lotions, and toothpaste. You may be surprised to learn it's also found in some of our foods, especially things like candies and chewing gum, to create the color the producer is looking for. Natural sunscreens work differently than chemical sunscreens. Synthetic sunscreen ingredients absorb UV rays. Zinc oxide and titanium dioxide, on the other hand, are physical sunscreens. They don't absorb UV rays, they block them. It's like having little "shields" over your skin protecting you from sun exposure. There's some indication that using physical sunscreens long-term give you better protection against photoaging because, unlike synthetic sunscreens, there is no chemical reaction occurring on your skin. The most obvious difference between synthetic and natural sunscreens is the way they absorb into the skin. Natural sunscreens do have a bit of a different texture and consistency than your typical sunscreen products. Many people describe it as thicker. It may take a bit more rubbing to get it to fully absorb. If you're used to the way synthetic sunscreens disappear into your skin without a trace, you may be surprised the first time you use a natural sunscreen. They leave a slightly opaque film to full-on white streaks, depending on the brand and formulation you use. The products that contain micronized zinc oxide or titanium dioxide will blend much more smoothly and evenly into the skin. If they don't completely disappear, they come pretty darn close. Micronized minerals are ground into a finer and smaller size, so they're much less obvious on the skin. But this is not without controversy. While zinc oxide and titanium dioxide aren't absorbed in their natural state, when ground into super small-size particles (called nanoparticles) they can more easily be absorbed into the body. The effects this may have on our health, if any, haven't been fully studied as of yet. Some people prefer to avoid nanoparticles because of this. At this point, especially if you're an avid DIYer, you may be thinking about just making a natural sunscreen on your own. Unfortunately, there really is no way to do this and be assured that you're getting the SPF you need to protect your skin. Contrary to what many blogs, online videos, and the like may say, there are no plant oils, essential oils, herbs, etc. that you can apply to your skin to give you natural sun protection. Yes, it's true that some plants do have natural sunscreen abilities. Coconut oil and red raspberry seed oil have a natural ability to block some UV rays, for example. But it's low, giving only an SPF 7 at the very best and an SPF 1 at the worst. Also, these oils aren't blocking UV at the right wavelengths. In short, they're allowing the burn-and-tan rays to pass right through, doing nothing to protect your skin. The sources that claim studies have proven these oils have sun screening abilities and can be used as a natural sunscreen are, quite bluntly, misinterpreting the data. So, skip this DIY product to save your skin. Look at the active ingredients. You're specifically looking for zinc oxide, either alone or with titanium dioxide. Zinc oxide gives broad-spectrum SPF, so it will protect you against both UVA and UVB rays. Titanium dioxide is most effective against UVB only, so it won't protect you across the full spectrum and shouldn't be used as a stand-alone active ingredient. But it can help boost the effectiveness of zinc oxide. Choose an SPF of 30 or higher. You'll want your SPF to be at least a 30. This ensures you get enough protection for a reasonable period of time. SPF can go up to 50+, but once you get over SPF 30 the increase in sun protection you get is incremental. Take a look at the other ingredients if you're looking for all-natural. There is no set standard for what constitutes "natural" for either cosmetics (like skin care products and makeup) or for over-the-counter drugs (like acne products and sunscreen). So, if you're looking for a more natural option for sunscreen (and any skin care product for that matter) you'll have to do a little investigating. Just because a sunscreen has natural active ingredients does not in itself make the sunscreen 100 percent natural. The vehicle—basically all the other ingredients in the sunscreen—could still be comprised of synthetic ingredients. This doesn't necessarily make the sunscreen any better or worse than others. It simply comes down to what type of product you're looking for and your personal preference. Decide if you want a micronized or non-nanoparticles product. A product labeled micronized, either on the front or in the active ingredients, will give you a sunscreen that absorbs more fully and leaves little opacity on the skin. This will give you an end result that looks and feels more like the synthetic sunscreens you may be used to. On the other hand, non-micronized or non-nano products will leave a white film across the surface of the skin that you can't rub in. But, if you're concerned about the possible health risk of nanoparticles, this may be an acceptable trade-off for you. There is a lot of information out there regarding sun protection and sunscreen, both natural and not-so-natural. It can be a confusing subject, simply because there are so much conflicting information and so many product options. Remember, though, that the best sunscreen product for you is one that you like, and that feels good on your skin because that is a product you'll actually use. And it's that consistent use of your sunscreen that's going to give you the best protection. If you still need help choosing a product, ask your physician or dermatologist for their recommendations. Grande F, Tucci P. "Titanium Dioxide Nanoparticles: a Risk for Human Health?" Mini Reviews in Medicinal Chemistry. 2016;16(9):762-9. Olsen CM, Wilson LF, Green AC, Biswas N, Loyalka J, Whiteman DC. "Prevention of DNA Damage in Human Skin by Topical Sunscreens." Photodermatoloy, Photoimmunology, and Photomedicine. 2017 Feb 6. Ou-Yang H, Jiang Ll, Meyer K, Wang SQ, Farberg AS, Rigel DS. "Sun Protection by Beach Umbrella vs Sunscreen With a High Sun Protection Factor: A Randomized Clinical Trial." JAMA Dermatology. 2017 Mar 1;153(3):304-308. Saewan N, Jimtaisong A. "Natural Products as Photoprotection." Journal of Cosmetic Dermatology. 2015 Mar;14(1):47-63. Souza C, Maia Campos P, Schanzer S, Albrecht S, Lohan SB, et. al. "Radical-Scavenging Activity of a Sunscreen Enriched by Antioxidants Providing Protection in the Whole Solar Spectral Range." Skin Pharmacology and Physiology. 2017 Mar 21;30(2):81-89. Are Nanoparticles Safe? Why Are They in My Sunscreen? What's the Best Soap for Washing Your Face?